The products were distributed to retail stores in the following states: Alabama, Colorado, Connecticut, Illinois, Indiana, Iowa, Kansas, Kentucky, Louisiana, Maine, Maryland, Michigan, Minnesota, Mississippi, Nebraska, New Hampshire, North Dakota, New York, North Carolina, Ohio, Oklahoma, Texas, Virginia and Wisconsin. We received three consumer complaints that the product contained peanuts, but no associated illnesses were reported. The recalled products were produced by a co-packer in Chicago and no other Ocean Spray® Greek Yogurt Covered Craisins® Dried Cranberries or Ocean Spray® products are affected by the recall. Our co-packer has reported some yogurt covered peanuts have been packaged along with Ocean Spray® Greek Yogurt Covered Craisins® Dried Cranberries on two production dates in February. Ocean Spray has worked with the co-packer to identify the issue and we’re confident that this is an isolated incident and the problem has been corrected. Although the packaging does contain a warning that the product is made on equipment that also processes nuts, Ocean Spray issued the voluntary recall out of an abundance of caution to ensure the safety of our consumers. 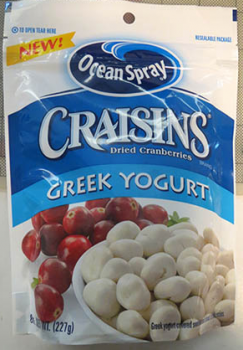 This recall affects a very small amount of our Ocean Spray® Greek Yogurt Covered Craisins® Dried Cranberries and we have not received any reports of allergic reactions. If you purchased Ocean Spray® Greek Yogurt Covered Craisins® Dried Cranberries with the above UPC code and sell by dates and have a concern about peanut allergies, please save or take a picture of the UPC label and best by date and contact the Ocean Spray Consumer Hotline at 1-800-662-3263, weekdays 9:00 a.m. to 4:00 p.m. Eastern Standard Time, for a coupon replacement. Please then destroy the product.